Renowned as both choreographer and dancer, Merce Cunningham (1919–2009) revolutionized dance through his partnerships with dozens of artists who created costumes, lighting, films, music, and décor for his choreographic works. This four-day series explores the profound effects of his work in the fields of dance, music, moving image, and visual art. All programs are free and open to the public. Presented in conjunction with the exhibition Merce Cunningham: Common Time, on view at the Walker through July 30, 2017. Merce Cunningham Across Media is made possible by the Robert Rauschenberg Foundation. Major support to preserve, digitize, and present the Ruben/Bentson Moving Image Collection is generously provided by the Bentson Foundation. 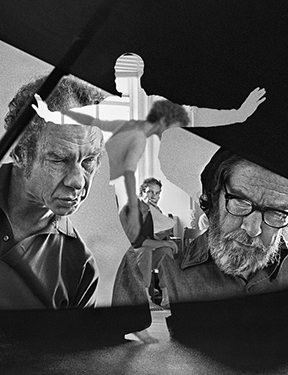 For nearly 60 years, the Merce Cunningham Dance Company was synonymous with challenging technique and dedicated training. The deep bonds and relationships fostered by working, training and traveling together were integral not only to Cunningham’s unique choreographic approach but also to the supportive structure that several company members continued in their own practices as choreographers. Former Merce Cunningham Dance Company members Patricia Lent (1984–93), Silas Riener (2007–11), and Andrea Weber (2004–11) share their experiences in this conversation moderated by Bonnie Brooks, associate professor of dance at Columbia College, Chicago. During a few select evenings and afternoons in March and April, former Cunningham dancers will perform events in collaboration with musicians in the Perlman Gallery at the Walker. Like for Cunningham’s dances, these sequences of existing choreographic excerpts are united with the music for the first time only during performance. Learn about this unique musical structure at Composed: Exploring Events, as musicians John Keston and Cody McKinny perform an excerpt of an event, and discuss the history and context of events with program curator Michelle Kinney and University of Minnesota musicologist Michael Gallope. Merce Cunningham’s dedication to pursuing the use of new technologies through his practice made him a central figure not only to the development of new forms of dance making but also to a community of artists who used the projected image as a mode of performance and artistic practice. This screening program offers a deeper dive into the world of Stan VanDerBeek’s “expanded cinema” and Cunningham’s “media dances” with a screening of avant-garde films related to Cunningham’s work with technology, film, and performance. A post-screening conversation follows between Gloria Sutton, professor of art history and media studies at Northeastern University, and John Kim, professor of media and cultural studies at Macalester College. During his 70-year career, Merce Cunningham commissioned designs for costumes and décor from more than 50 visual artists, whose work with MCDC often had a profound impact on their independent practices. On this panel, three historians explore work by some of those artists. Art historian Juliet Bellow will discuss Cunningham’s partnership with Isamu Noguchi, who created décor and costumes for Cunningham’s 1948 ballet The Seasons; dance historian Roger Copeland will discuss Robert Rauschenberg’s decade of work as Cunningham’s artistic director; and art historian Liz Kotz will present her research on Robert Morris’s unique blend of sculpture and choreography through an analysis of his design for Cunningham’s Canfield (1969). Moderated by Common Time co-curator Joan Rothfuss.